Wildfire's motto this season has been, "Start early and often." The Hansel Creek fire is just a few miles west of us. It started Saturday from lightning and has been slow to grow so far. We were hiking there last weekend. Apparently the fire is about 20 acres now, burning on the fringe of a large tract of private forest land, but information is scarce. Ingalls Creek residents, including people we know, are getting their Level 2 evacuation notices today. 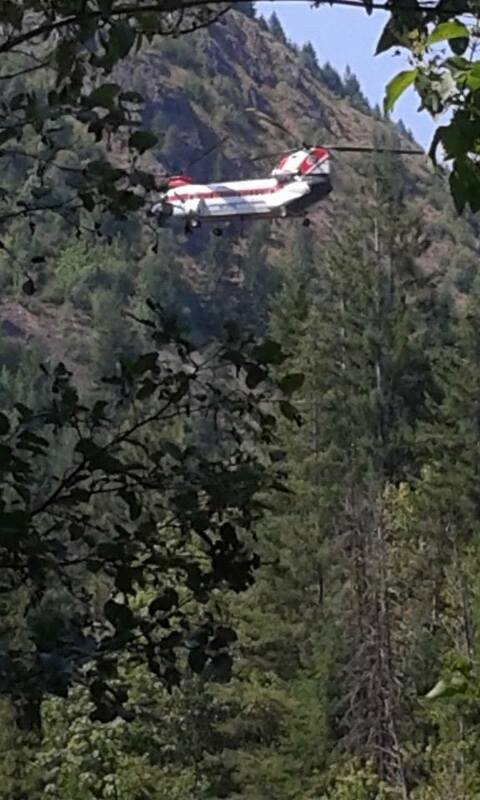 From the County yesterday 8/4/14: "This [Hansel Creek] fire is burning on steep ground in heavy fuels. Projections show it wanting to move toward the east. Expected fire behavior on Monday will be torching, spotting and roll-outs of burning embers down the slopes. 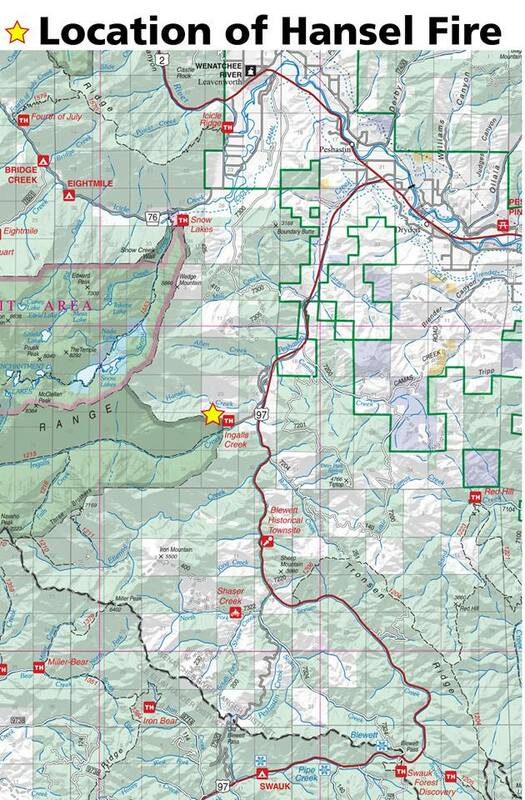 Lake Wenatchee Ranger District personnel will be sweeping the popular Ingalls Creek Trail to ensure no hikers are in areas of possible fire growth." Area: Blewett Pass highway. Leavenworth and Peshastin are NW on US2 and Cle Elum is south on US97. 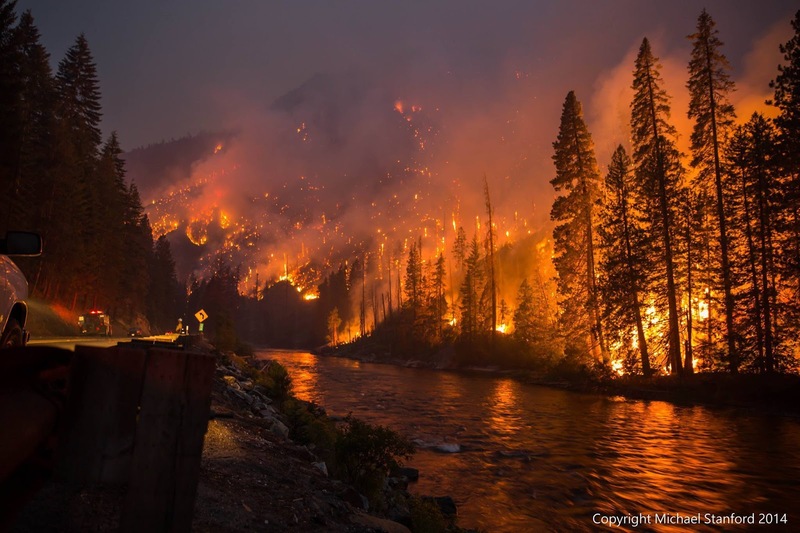 The Chiwaukum Creek Fire is 10-15 miles away, burning in the Alpine Lakes Wilderness and Tumwater Canyon. The week this fire started we had a coating of ash and charred fir needles on our place. The fire has closed US Highway 2 since July 15 and forces us to use a detour to get back and forth between here and Seattle. The fire is at 17,000 acres and 35% contained as of today. Chiwaukum Creek fire burning along US2 in Tumwater Canyon. Plenty of smoke is hanging around the region as a result of these and the 255,000 acre Carlton Complex fires in the Entiat River area. There's actually a blog all about Washington smoke and air quality. Generally we've gotten off light compared to the smoke in downtown Leavenworth.